Stop allergies, take control and improve your life. Many of us are affected by allergies, from the dreaded hayfever - the scourge of the summer - to much talked-about food allergies such as lactose and gluten. 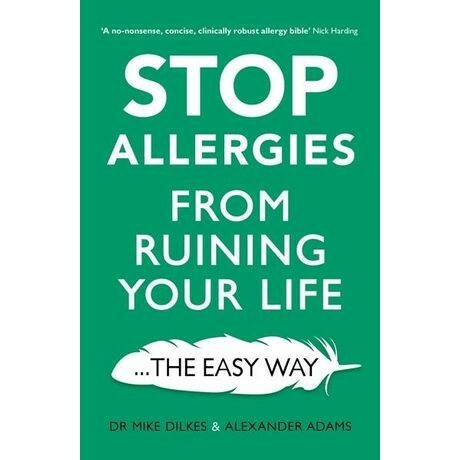 Dr Mike Dilkes, one of Harley Street's top Consultant ENT Surgeons, reveals his top tips for living with and treating an allergy. Find out the difference between a sensitivity, an intolerance and an allergy. Discover how allergies affect your body and why. Learn how to see through the hype and take control of your own symptoms. Prevent attacks and treat outbreaks. With a no-nonsense approach to this controversial topic, Stop Allergies from Ruining Your LIfe... The Easy Way provides a straightforward analysis of the latest scientific research, allowing you to live the life you want, whatever the season. Dr Mike Dilkes has been a consultant Ear, Nose and Throat surgeon in London's Harley Street for over 30 years. He is always at the forefront of new developments in his field and has innovated many new techniques over the years. Alexander Adams began his professional career as a clinical expert with GlaxoSmithKline. He has a talent for translating complex terminology into engaging formats, which anyone can understand and benefit from.